Gluten Sensitivity: What Does It Really Mean? "Are you the nurse? You look so young," I said to my mom as I slowly emerged from my anesthesia-induced slumber, apparently not coherent enough to know who she was (but thankful that my drugged speech was so complimentary). I'd just undergone an endoscopy, meaning a doctor had inserted a small, flexible tube through my mouth down into my small intestine. After sampling the intestinal tissue, he'd be able to tell me whether I had celiac disease, an autoimmune disease in which eating gluten-containing food causes the destruction of the small intestine's inner lining. Soon, the diagnosis came: negative. My doctor explained that, rather than celiac disease, a "gluten sensitivity" was likely the cause of the bloating and abdominal pain I'd been experiencing. 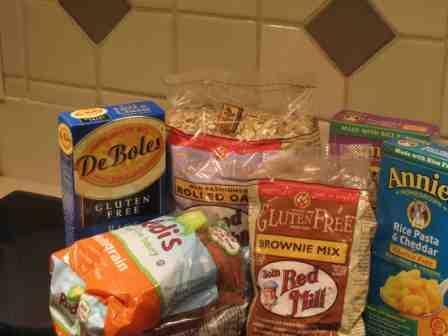 If I removed or reduced the gluten in my diet, I could probably reduce my symptoms. So I did. And for the most part, staying away from gluten meant the discomfort stayed away too. But eventually my science background got the better of me, and I had to know what was really happening in my body. What does "gluten sensitivity" really mean? Unfortunately, there's no easy answer. When patients without celiac disease exhibit symptoms that improve with a gluten-free diet, they are often categorized as "gluten-sensitive." These symptoms may range from abdominal pain to bloating to fatigue. In the past, the very existence of the condition has been questioned because of its unclear diagnosis. However, as the New York Times notes, new studies suggest that gluten sensitivity does exist. What this and other recent articles haven't mentioned is that researchers have gained some interesting insights into how it may work. They've also discovered that so-called "gluten-sensitivity" may not be caused by gluten at all. To understand new research on gluten sensitivity, it's first important to understand the other two gluten-induced conditions, celiac disease and wheat allergy. Both conditions involve the immune system. In celiac disease, the presence of gluten in the small intestine triggers a response by the adaptive immune system, which is the part of the immune system that reacts to specific invaders by producing antibodies. The unwanted immune reaction ultimately leads the body to attack its own healthy enterocytes, or cells lining the small intestine. One reason this unwanted response occurs is because individuals with celiac disease have a "leaky gut." Enterocytes lining the small intestine are normally "glued" together by tight junctions. In people with celiac disease, the glue doesn't hold. Gluten fragments can sneak through these gaps and provoke an adaptive immune response that damages the intestinal lining (the full mechanism is described in great detail in this 2009 Scientific American article). The second type of gluten-induced condition, wheat allergy, is also mediated in part by the adaptive immune system. In this condition, gluten results in synthesis of IgE antibodies that cause an inflammation. Inflammation can cause local discomfort and damage to healthy tissue. People with "gluten sensitivity," on the other hand, do not show evidence for the type of immune reactions that occur in those with celiac disease or wheat allergy. If the adaptive immune system is a tailor who designs custom jackets, the innate immune system uses one-size-fits-all ponchos. Instead of making antibodies that recognize specific invaders, cells of the innate immune system have receptors known as TLRs that recognize broad patterns present on a variety of invaders. Then, the TLRs trigger a quick inflammatory response. A 2011 study found gluten-sensitive patients have higher expression of the TLRs compared to control patients. This finding suggests the involvement of the innate immune system. In addition, the study supported the idea that the adaptive immune system is not involved in "gluten sensitivity." Enterocytes of gluten sensitive patients are tightly glued together, unlike those of celiac disease patients. As a result, gluten fragments can't get in between the cells to activate the adaptive immune system. But is this innate immune response actually caused by gluten? Data from another study published in December suggest that a family of proteins in wheat may be to blame. The proteins, amalyse-trypsin inhibitors, or ATIs, activated one type of TLR and caused an innate immune response in human immune cells and in live mice. Interestingly, the ATI content in wheat has dramatically increased in recent years. ATI proteins naturally protect wheat from pests. As wheat is bred to be increasingly pest-resistant, ATI content also increases. An increase in ATIs might explain what appears to be a growing amount of gluten-sensitive people. ATIs aren't the only non-gluten molecule accused of being behind so-called "gluten-sensitivity." Wheat carbohydrates, known as FODMAPs, have also been implicated. However, these molecules don't cause abdominal discomfort and other symptoms by provoking an immune response. Instead, the indigestible nature of these carbohydrates might cause water retention and gas production in the small intestine, leading to bloating. While we've made some progress towards better understanding what may cause "gluten sensitivity," many questions remain. In the meantime, for those whose doctors recommend a diet sans gluten, there will be plenty of food to choose from, as the gluten-free market continues to boom. 1. Aziz, I., Hadjivassiliou, M., & Sanders, D.S. (2012). Does gluten sensitivity in the absence of coeliac disease exist?. British Medical Journal, 345, e7907. 2. Fasano, A. (2009, August). Surprises from Celiac Disease. Scientific American, 301(2), 54-61. 3. Junker, Y., Zeissig, S., Kim, S., Barisani, D, Wieser, H., Leffler, D., ... Schuppan, D. (2012). Wheat amylase trypsin inhibitors drive intestinal inflammation via activation of toll-like receptor 4. Journal of Experimental Medicine, 209 (13). 4. Sapone A., Lammers, K.M., Casolaro, V., Cammarota M, Giuliano, M.T. ... Fasano, A. (2011). Divergence of gut permeability and mucosal immune gene expression in two gluten-associated conditions: celiac disease and gluten sensitivity. BMC Medicine 2011, 9(23). 5. Shepherd, S.J., Parker, F.C., Muir, J.G., & Gibson, P.R. (2008) Dietary triggers of abdominal symptoms in patients with irritable bowel syndrom: randomized placebo-controlled evidence. Clinical Gastroenterology and Hepatology, 6, 765-71.